Driving across Memorial Bridge at 10 pm never gets old. 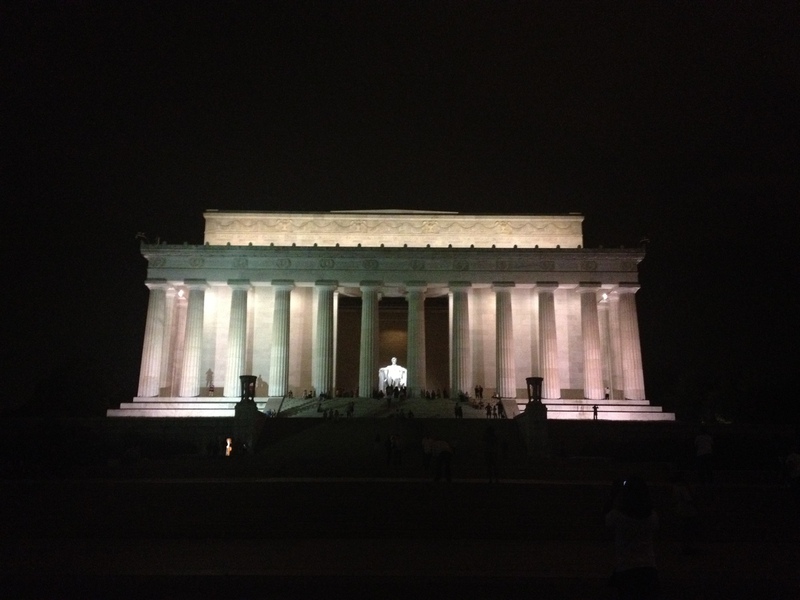 The Potomac glistens under the pale moon on both sides, and the Lincoln Memorial glows majestically. I was hoping for more solitude around the memorial, but crowds of tourists and locals alike were chattering, walking, sitting, picture-taking, and everything in between. As I sit on the top of the marble steps, looking down at the pool reflecting the Washington Monument, I think to myself, there’s no better way to spend a precious Sunday night of a long weekend. Rain comes in droplets, but hell, that makes it even better. Thoughts and no-thoughts. One second, twelve-and-a-half thoughts rush through my clogged head. The next moment, I am blank, filled with nothing more than what’s in front of me, and the cool droplets gaining presence. I walk away. Full. Content. Life is perception. Faith is perception. Walking up the marble stairs, sitting atop the marble stairs, walking down the marble stairs, leaving it all behind.